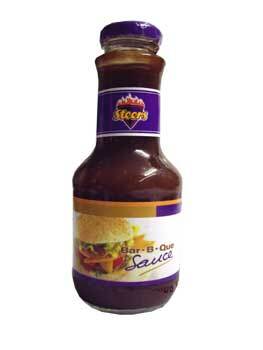 No South African braai is complete without Steers barbeque sauce, adding smoky and fruity flavours to your steaks, chops and burgers, but also great with fries and chicken. This can transform an ordinary sandwich or piece of meat, making it reminiscent of a braai from back home. Water, Sugar, Tomato Paste, Stabiliser (Modified Starch), Salt, Acidifiers (E260), Reconstituted Worcester Sauce (Colour (E150d), Sulphur Dioxide, Garlic), Preservatives (E211, E202), MSG (Flavour Enhancer), Garlic).